There are few joys in packing to move, but for me, one good aspect is the opportunity to clean out things you no longer need. In my case, it’s going through nearly 15 years of acquired curricula – a mish-mash of my own training and lots of workbooks saved from other people’s workshops. I kept notes from that workshop, a presentation on creativity called “Beyond Common Sense.” It was remarkable then for me, as now, because Geoff showed very simply the relationship between common sense and creative thinking skills. Since then, I’ve used his original notes as a springboard of my own to talk about how to harness your subconscious to think more creatively. First, a definition of common sense: one’s sound understanding and judgment, but not based on specialized education; this truth is shared by (or ‘common to’) nearly all people. Geoff began his training by drawing a circle, representing all the infinite amount of information in the universe. He carved out a small pie piece (see chart right, in blue), and named it What You Know You Know. The first thing I learnt in adult training is the student must know they know something, because if they don’t know they know it, they can’t repeat it, and therefore cannot improve. Geoff took this learning a step further, saying that our common sense manages this known information for us. It tells us how to use it, how to apply it to problems or opportunities, and how to put it into practice through ideas and implementation. Geoff next carved out a second piece, slightly bigger than the first and named it What You Know You Don’t Know. It’s easier to provide an example than define this piece. For me, I know I know very little about opera, polo or meteorology. But even without this knowledge, my common sense manages my behaviour. Depending upon how I interested I am in a particular subject, to learn more I might read about it, study it, practice it, take classes or lessons, or apprentice from someone who does know. In other words, it’s easy to tap into what I don’t know. 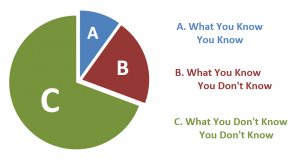 The third and last area is what Geoff called the most important area for creative thinking: What You Don’t Know You Don’t Know. He said: “It’s a new realm (to us), a new distinction, a new domain that’s unavailable from our present point of view. It is here that we find an enormous but untapped wealth of knowledge, resource, ability and power. To say it another way, if we can tap into this significant part, this infinite well of intelligence, we can fully realize our creative potential. And, the way to tap into this area of subconscious is to 1) be actively curious and 2) take every opportunity to discover new knowledge through open questions. I remember saying to myself: That’s a lovely thought. But how? How do I dig into that hidden part of my mind? Through meditation? Psychotherapy? Hallucinogenic drugs? Hypnosis? That’s a question he didn’t answer. But, over the years I’ve kept adding ways to dig into this subconscious thinking, eventually coming to 10 neat suggestions. But, before I get into my top 10 list, let me offer a word of advice. Always keep the proverbial pen and paper at hand (either real or digital) so you can record your thoughts when they come to you. Don’t rely upon your memory. 1. Give your subconscious a problem to solve. Your mind likes a problem, but it works best when you give your subconscious a specific issue to mull over and obsess. Even better, write down the problem, memorize it, and keep it handy. 5. Pay attention to your dreams. Dreams disappear within 15-30 seconds after we wake up, so you need to immediately consider what you remember about your dreams. Again, have paper or an audio recorder handy to capture your thoughts. 6. Learn to meditate. Meditation is focusing the mind by quieting it. Doing so harnesses the brain’s potential. There are many ways to meditate so you need to choose the way that’s best suited to your lifestyle and practice it frequently. 7. Use visual stimulus. Your brain thinks visually, not in letters, words or sentences. Use post cards, pictures from magazines and Google Image search, or random visual stimulus (like a walk around the block, or a different path to work) to inspire your creativity. 8. Write. 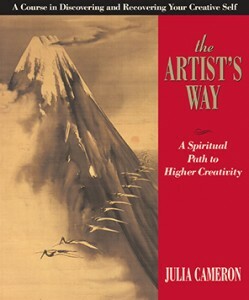 Julia Cameron writes in The Artist’s Way (a brilliant book, by the way) about stream of consciousness writing. Literally, every day at the same time, sit down and just write. Do not edit. Do not censure what you write. Do not pretend the writing will turn into a bestseller. Most of what you write will stink. But do not stop: just write. By allowing your subconscious to speak to you through your open-minded writing, you very possibly will be amazed at what comes out of your head. I’ve sworn by this approach for years. 9. Use your network. If you have a hard time tapping into your own subconscious, go talk to others. Different people bring different perspectives which – if you remain open – can point you toward new alternatives. 10. Listen to your intuition. Your intuition is directly connected to your subconscious and your inner voice. Your first response is the one most important and natural to you, so think hard about why you want to behave or decide differently than your gut reaction. Do you need to listen to your first response? What other methods have you used to tap into your subconscious thinking?